I have a nonsensical fear of yeast. Maybe it's because it's alive. But at my husband's gentle urging (in which he finally said the words that will always spur me to get my act in gear: "I dare you. "), I finally tried my hand at making pretzels. There was yeast and milk, flour and rising, towels and warm places. There was punching and separating. And then I stepped aside to photograph the master pretzel maker at work. (He is, after all, a hand model. We may not have them down pat yet. But we sure do know how to give a pretzel a baking soda bath. we promptly ate all six. Carbs are our love language. Warm the milk in a saucepan or microwave to about 110 degrees. (I usually just use a finger test. You don't want it too hot or it will kill the yeast. Just a nice warm temp that doesn't hurt your finger.) Pour the milk in to a medium sized bowl or your mixer bowl. Sprinkle the yeast on top. Let it soften, about 2 minutes then stir in the brown sugar and 1 cup of flour. Dice 2 tablespoons of the butter into small pieces and soften it (don't melt it!) Stir the butter into the mix. Add the remaining 1 1/4 cup flour and the fine salt to make a sticky dough. Turn it onto a lightly floured surface and knead or just knead it in the mixer if you have one (use the bread hook). You want a smooth dough but still slightly tacky. Knead for about 5 minutes. Cover the bowl with a towel and let rise in a warm place until double in size, about 1 hour. Pre-heat oven to 450 degrees and line a baking sheet with parchment or spray with cooking spray. Dissolve the baking soda in 3 cups of water in a shallow baking dish (I use a 8x8 pan). Set pan by the prepared baking sheet. Punch the dough and then turn it onto a lightly floured surface. Divide the dough into 6 pieces. 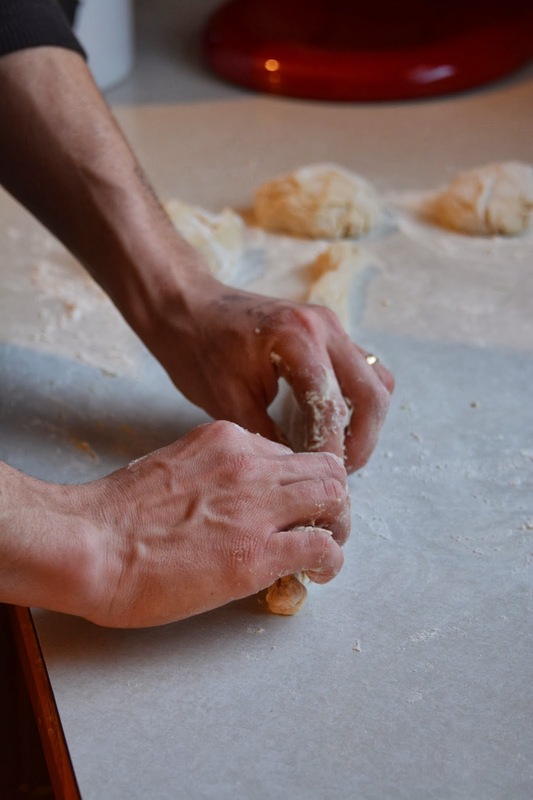 If you want to make 6 pretzels: Roll and stretch each piece with the palms of your hands (using flour if necessary) into a 24-30 inch rope, holding the ends and slapping the middle of the rope on the counter as you stretch. Form each rope into a pretzel shape. 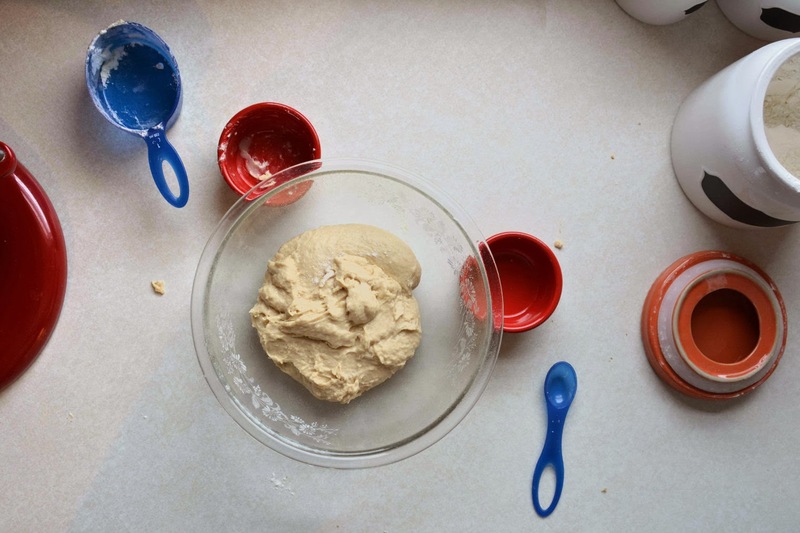 If you want to make pretzel bites: Roll and stretch each pieces into a rope but instead of shaping into a pretzel, cut the ropes with a pizza butter into the desired size of bites (about 2 inches is what I usually do). Bake until golden, 8-10 minutes for bites, 10-12 minutes for pretzels. While they are baking, melt the remaining 6 tablespoons of butter in a shallow dish (I use a pie pan). Set it next to a cooking cooking rack. Dip the warm pretzels in the melted butter then place on a wire rack to let excess butter drip off. Serve the pretzels warm with mustard or in a cheddar cheese sauce. Sprinkle with additional salt if needed. Makes about 60 pretzel bites or 6 pretzels. 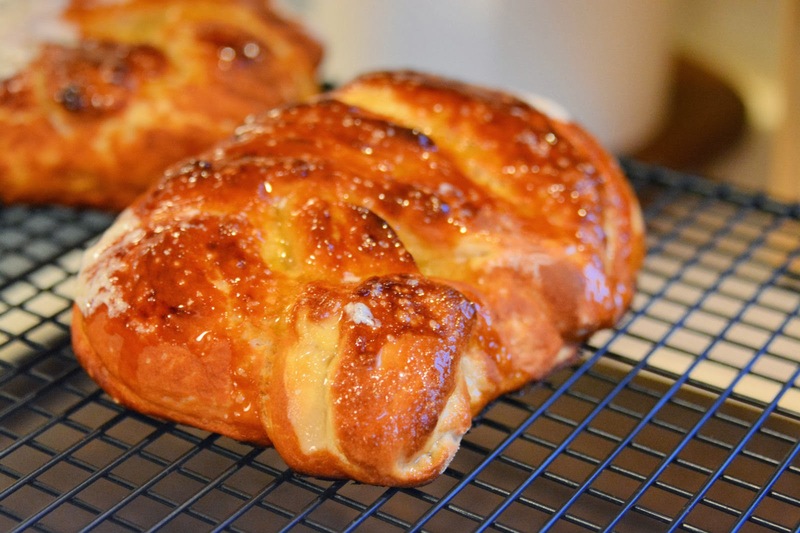 NOTES: The baking soda mixture is what makes the pretzels turn the golden color. Although you could skip the last butter bath, I highly recommend it! I promise it's worth it! And if I am making these for a bigger group, I usually triple the batch. But what does an RD say about two people consuming six in one sitting? Wait. Maybe don't answer that.